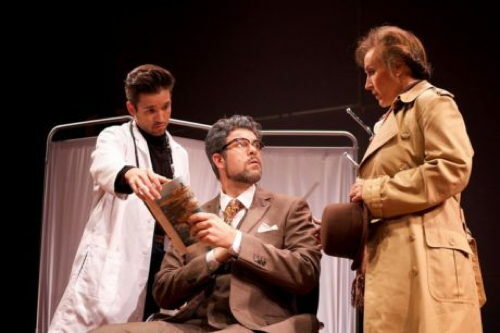 Based on the Oliver Sacks novella, this story follows Dr. P, an opera singer and teacher who recently started experiencing some vision challenges. His wife, Mrs. P insists that there is nothing wrong and his neurologist Dr. S is baffled by the man’s rare neurology. Sacks wrote the libretto with Christopher Rawlence and Michael Morris. Michael Nyman composed a beautifully flowing score that perfectly reflects the story. His work is flowing a classical but still very contemporary, reminding us of Dr. P’s roots but also his current position. This is an excellent piece for people who feel intimidated by opera. Nyman’s complex score was played masterfully by Inscape Chamber Orchestra under the direction of UrbanArias founder Robert Wood. Wood is a delightfully cheery conductor who leads the ensemble with poise and enthusiasm. The musicians played with great dexterity and brought this beautifully complex score to life. Dr. S was sung by tenor Ian McEuen. McEuen has a lovely and clear voice that soars and shows great depth of emotion. Occasionally he could not be heard over the instruments and other singers but in his solo moments, his voice carried a sweetness that was charming and engaging. Jeffrey Beraun tackled Dr. P. His resonant bass was well-controlled and beautiful. His aria in the third section was stunning and touching. Beraun is a strong actor who shows us the urgency of a man who wants to know what is wrong but also shows us the humor of his situation without being obnoxious. His nuanced acting partnered with his magnificent voice made the character the most enjoyable. Mrs. P was played by the incredible Emily Pulley whose strong soprano moved the show along with grace and earnestness. She is a great duet and acting partner for Beraun. Their chemistry is excellent. She commands the stage and keeps the men of the opera in check. The use of an overhead projector was fascinating and possibly brilliant. A typical doctor’s office at the time would have had one. It was on stage and used to show images and at one point a chess game. It was clever and visually engaging. The back wall of the set was also used for projections that helped progress the story without being distracting. They were subtle enough show off what the singers were talking about without making it about the images. That is a feat that isn’t always successful. This is an excellent piece for people who feel intimidated by opera. English, modern and satisfying, it is an excellent gateway. UrbanArias certainly achieved their goal of making opera more accessible and entertaining for DC audiences. Running Time: One hour, without an intermission. “The Man Who Mistook His Wife For A Hat” runs at the Atlas Performing Arts Center until October 22. Click here for more tickets and more information.